On the 24th December, 1705, Sahibzada Zorawar Singh Ji and Sahibzada Fateh Singh Ji along with Jagat Mata Gujri Ji (mother of Guru Gobind Singh Ji) were arrested by Kotwal Jaani Khan of Morinda at Kheri, the native village of Gangu Ram also called Ganga Dhar Kaul (ancestor of Nehru and Indira Gandhi). Gangu was a servant of Guru Gobind Singh who was allured by the money and jewellery which Mata Gujri Ji carried and, thus, informed the Kotwal of Morinda about their presence in his house. Jaani Khan brought them as prisoners to Sirhind. Faujdar Wazir Khan of Sirhind imprisoned them in the Thanda Burj (cold Fort). Baba Moti Ram Mehra was a servant in the Hindu kitchen of the Faujdar. He used to serve food to the Hindu prisoners. Jagat Mata Gujri Ji refused to accept the food of the Mughal kitchen as well as that which came from Diwan Sucha Nand’s house. Baba Moti Ram Mehra was a great follower of Sikh Gurus. He used to serve the Sikhs on their way to Anandpur Sahib and back to their homes. The Sikhs took rest at his mud house, where the mother of Baba Moti Ram Mehra and Bibi Bholi Ji, wife of Mehra Ji, prepared food for these Sikhs. When Jagat Mata Gujri Ji refused to accept the food, Baba Moti Ram Mehra could not bear the Sahibzadas sleeping hungry. He came home and told his family that he would serve milk and fresh water to these great prisoners. His mother and wife were scared and tried to persuade him not to take such a step. Bibi Bholi, his wife, told him that the Wazir Khan had made an announcement in the town that whoever tried to help and serve any type of food to the sons of the tenth Guru, he along with his family would be crushed alive in a Kohlu, (the oil squeezer). This information could not change the resolve of Baba ji. His mother told him that there were so many followers of the Guru in the town; they could have dared to serve the Sahibzadas. Baba Moti Ram Mehra humbly, but with determination, told his mother that those followers feared the ruler. “Aren't you scared, my son?” asked the mother. Baba Mehra ji humbly replied, “Dear mother our Guru is fighting against injustice of the Mughals. I will serve the great mother and the Sahibzadas. I don’t fear the punishment of the Faujdar. The history will not forgive us if we do not serve the great prisoners." Sensing his determination, his wife gave him her silver jewellery and some coins and requested him,” Please bribe the gate man of the Burj and request him to keep this act a secret.” Baba ji praised his wife for participation in the great cause. 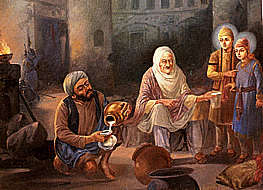 Baba Moti Ram served milk and water to the Sahibzadas and Mata Gujri Ji for three nights. On 27th December 1705, the Sahibzadas were slain after the attempt at bricking them alive in the foundation of the wall failed. Mata Gujri ji also breathed her last. Raja Todar Mall of Sirhind performed the cremation. He told Baba Mehra ji to arrange a cart of Chandan wood, which he brought from the forests of Atta Ali. After some time, Pumma, the brother of Gangu, told the Faujdar that his servant (Cook) had served the prisoners with milk and water. Baba Moti Ram Mehra, his mother, wife and a little son were arrested. He did not conceal his act and boldly told the Faujdar that, it was his dharma to serve the young children and the aged mother of Guru Gobind Singh Ji. So, Baba Moti Ram Mehra along with his father was sentenced to death by being squeezed in a Kohlu (oil press). His sacrifice was first sermonized by Baba Banda Singh Bahadur ji.